I avoid Splenda always. I cannot believe it’s in pickles! I returned them and bought a totally different brand. Are you as shocked as me? Why do need to put additives in everything? Vicki, the "pickles" you're making are lacto-fermented, and they're very good for you! There are lots of good (probiotic) bacteria in them, and they help with digestion. Lacto-fermenting also makes the nutrients in the veggies more easily absobed by your body. This is an old, old, technique for preserverving food. Check out the website Wild Fermentation for more info. 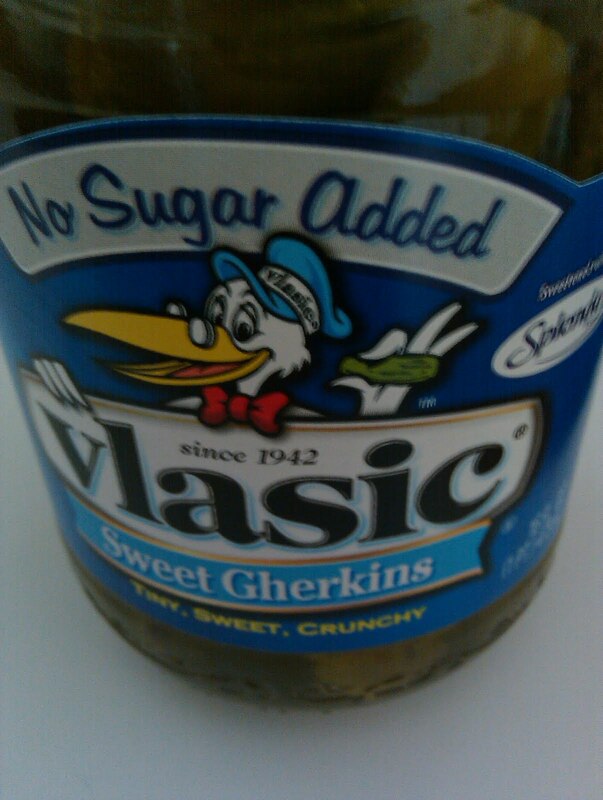 Things are advertised as "no sugar added" if the product contains natural sugars, such as the cucumbers used to make pickles. I definitely look for things with less sugar. Like the other day (comments of this site) when we were talking about applesauce. I have never understood the *need* to put any sort of sweetener in applesauce. We always eat unsweetened but I do have to make sure I buy the right jar because most of them in the supermarket have some sort of sweetener added. I guess that means most people eat sweetened applesauce. For jelly, we eat Palmers Fruit Spread which is sweetened with fruit juice so it's not unsweetened, but it tastes less sweet to me than regular jelly. However, even Palmer's also has a variety that has some sort of artificial sweetener added to make it more sweet. I don't understand why smooshed fruit *needs* to be *more* sweet than it already is (probably goes without saying I also buy unsweetened peanut butter – just peanuts). We make our own pops out of fruit juice or homemade smoothies. They're sweet just from juice and fruit and I see no need to add any extra sweetener to that either. Sure, we like soda and candy as much as the next person, but I try to not make that our every day diet. I think ultra-sweet stuff like that should be a treat or a special occasion, not every single day. Thanks Jen for the "lacto-fermented" info! I've been reading on the internet all morning and plan on a trip to half priced books this afternoon to see if I can find Nourishing Traditions. this is the kind of pickle my Russian friend gave me. She and her daughter ate a bit of this pickle with most meals. Like yogurt, they helped with digestion. Regular pickles do not do this. I find it all very interesting. You know, I went to the grocery store this morning and I made it a point to read almost every label. I was amazed … AMAZED … at how many things had Splenda (blech) or Aspartame in them. Amazed. Not sure how many people realize that sugar is a healthy part of one's diet – you are meant to have some sugar intake. Splenda actually does NOT have aspartame in it. I personally use Splenda in the place of sugar most of the time (I try to do a balance of sugar and splenda) and it tastes the same as sugar to me. I guess there are some extremely picky eaters here – it's no worse for you than overly consuming sugar. That is the one of the sites I have found about it. Splenda contains aspartame, Aspertame turns into formaldehyde when it's mixed with the stomach acids. you can get formaldehyde postioning and it's also what they use to im-bomb you with!! Sugar is natural and Splenda is chemicals (sorry but True!!). Yeah, pretty scary. I took my kid shopping today, and he kept asking for the "strawberry applesauce". Sorry, kid, it's got high fructose corn syrup. With that, partially hydrogenated vegetable oil, MSG, and food coloring, you can see why I cook most things from scratch. Splenda is made from sugar. They start with a sugar molecule and pop off two of the hydrogens and replace them with a chlorine atom. Chlorine atoms bond in the same way as hydrogens, but their much greater size gives them a higher electronegavtivity which makes their bonds much more polar. (Hydrogen to carbon bonds are nearly non polar, which is what our body is used to breaking down, it doesn't know what to do with highly polar bonds.) These very polar bonds allow the sucralose molecule to bind to our taste receptors 600 times more strongly than sucrose can. Thats why anything sweetened with splenda can become overly sweet very easily. Personally I find it suspect that they feed us sugar that is altered by a poisonous gas. Another scary thing about artificial sweeteners is that they have LD50s. An LD50 stands for a leathal dose that kills half of the test population. Sucralose's LD50 is 28 packets per day. Aspartame is 74 packets or 22 can of diet soda. And the scary one, saccharin is 12 packets. With the way artificial sweeteners are added to children's food I could see that one being reached. Also these numbers are for adults, I'm sure the daily intake limits are lower for children. In case you are wondering where I got these numbers, I am a biochemistry major and artificial sweeteners are something we cover in class. I avoid artificial sweeteners as much as I can – I won't consume diet drinks or yogurt. I find a LOT of things too sweet, like juice, and granola bars, and just wish "no sugar" meant "unsweetened"
You're welcome Vicki. It's awesome you were introduced to this method by your friend. I've been making sauerkraut, and lacto fermenting many other veggies (carrots with garlic and onion are good) as well. I hope you find a copy of Nourishing Traditions… it's excellent! That's the book that started our family on our real food journey a few years ago. Now we really try to avoid (we're not perfect) processed foods, and cook whole foods from scratch. Have fun with your fermenting! I honestly just try to balance my sugar intake with my artificial sweetener intake. I try to eat fewer sweet things and I know that low fat/sugar/salt always is a trade-off for an unnatural ingredient. For the poster above that asked why you add sugar to jelly; you have to have sugar and pectin or you just have cooked fruit and it won't get firm. The amount of sugar and pectin varies depending on the fruit and it's ripeness. As a guideline, our family recipe for jam calls for a cup of sugar to a cup of fruit. The amount of pectin needed is dictated by the box of pectin. Generally, really sour fruit needs less pectin than really sweet fruit. I tried to make sugar-free preserves once and I was very disappointed in the results. It didn't taste bad, it was just more like mashed fruit without jelly binding it together. After reading these comments, Im just posting to encourage everyone reading these comments to remember that the people posting these comments are random anonymous people posting on the internet, who may be posting deliberately incorrect information. I was horrified to read Emilys post above, especially given her claim to biochemistry education. She is completely mistaken about the LD-50 levels for artificial sweeteners. To save space, we will discuss splenda. Published (peer-reviewed) studies have looked at sucralose toxicity, and shown *no* deaths OR treatment related effects at doses of 10g/kg (which is like a 150 pound person consuming 1.5 lbs of splenda at a sitting). I suppose this could translate to 28 packs a day if each pack had more than an ounce of splenda, but we all know this is not the case. Food Chem Toxicol. 2000;38 Suppl 2:S53-69. Acute and subchronic toxicity of sucralose. Whoever is the anonymous under my last comment – again Splenda does NOT contain aspartame. If you refuse to believe me, here is a link proving it. All I ask is for people to actually read about the product before assuming. Also those with diabetes be careful of splenda. Most artificial sweeteners are cut with actual sugars (generally maltodextrin). When you buy splenda you are actually buying a lot of maltodextrin with a bit of splenda mixed in. Many studies show they spike blood sugar levels just as much in many people. "Sweet Deception" and other books have great explanations and citations to the research. The ingredients in Splenda are sucralose, and bulking agents, e.g., dextrose and/or maltodextrin.